Every guy wants to look and feel good in the clothes that he wears, but for many who are only just starting to develop their wardrobes and personal styles, finding a way to simply get started can present a seemingly insurmountable challenge. I’ll use myself as an example: before I started to cultivate an interest in menswear and fashion, even something as simple as matching clothes together outside of my normal rotation of unflattering jeans and graphic tees felt way outside my skill set. A lifelong relationship with mandatory catholic school uniforms had resulted in my total ignorance of even the most basic knowledge necessary to put a decent outfit together. Even if I had found myself in the perfect menswear boutique, I would have been totally lost: how do you know which kind of clothes to start considering? However, after years of learning and discovery, I’ve developed a distinctive, clean, and versatile personal wardrobe of clothes that I love to wear. What I learned was that once I developed that basic understanding of how clothes fit together in an outfit -- little things like how to prioritize colors or how to ensure a shirt fits properly -- I felt significantly more confident when thinking about how to improve my wardrobe. It took the intimidation out of the process of shopping for clothes and turned it into something understandable and even fun. So whether you’re the type of person who’s never felt like they’ve learned the skills necessary to put together a nice outfit, or you’re just looking to add one or two more skills to your sense of style, this guide should point you in the direction of all the tools you need to start to improve your sense of personal style. This one might seem a little strange at first pass, but is absolutely one of the most powerful things you can do to improve your taste. By regularly looking at other people’s outfits, you’ll be able to identify a sense of which garments, fits, and styles you find the most exciting -- and which ones you really dislike. This is also critically important for demystifying the process of shopping for clothes: you’ll start to see clothes in boutiques as pieces of outfits you’ve seen before rather than garments that you have no idea what to do with. This doesn’t have to be exceptionally time-consuming, either. If you’re anything like me, you probably spend at least some part of your daily routine consuming media, so little changes to your media diet can make developing a sense of style feel like just going about your normal life. Even something as simple as following social media pages that share a variety of outfits can make a huge difference. If you’re looking for somewhere to start, try following the #waywt (what are you wearing today) or #menswear hashtags on Instagram or Twitter, or spending some time on reddit’s /r/malefashion and /r/malefashionadvice. Speaking of reddit’s /r/malefashionadvice, members of their community have made some seriously useful resources for people new to fashion over the years, and they were central to helping me develop fundamental fashion skills. No matter what specific skill you’re looking to develop, there’s a surprisingly decent chance that someone has written, published, and revised a highly detailed and non-judgemental guide to it on this site, entirely for free. It sounds too good to be true, but there’s really no catch: you don’t even need to create an account or give them your email. I sincerely consider these guides one of the Web’s best-kept fashion secrets, and I still go back from time to time for more information and advice. If you’re looking for an entry point, I started with Building a Basic Wardrobe v6. From there, you can dive into some of the more specific guides like Livemethod’s Heroically Enormous Seasonal Color Guide or A Step-By-Step Guide to Starting to Dress Well for the Risk-Averse Neophyte. Some of the subreddit’s other widely-lauded guides are linked in the sidebar, but feel free to use the search function to find whatever your heart desires (just make sure to limit your search to /r/malefashionadvice or you’ll be looking through all of reddit’s detritus on your quest for answers). With the help of these guides, you’ll be able to develop a basic set of rules that you can build on as you continue learning and exploring. After reading up on the basics and taking a look at a few cool outfits a day, you’ll soon start to find that patterns naturally emerge. Maybe you love those super-slim leather boots everyone seems to be wearing, or have found a color palette that you notice that you like every time you see it. Whatever your interests are, it shouldn’t be too hard to narrow those into a specific set of key items: a shopping list of sorts. For me, I noticed soon after I started this process that a basic outfit that I tended to like on everyone was low-top white sneakers, slim jeans, and a button-down with rolled up sleeves. Adding those items to my wardrobe was simple and inexpensive, and I started to compose my first outfits that I could be proud of. You might think that I’d recommend you buy your first outfit from Blaine’s, but for most cases, I probably wouldn’t -- not because the clothes at Blaine’s aren’t excellent (they are extremely excellent), but because investing in high end menswear should be something you do after you’ve developed your personal style. (I actually just wrote an article about when to invest in high end menswear, so click here if you’re interested). Keep these initial pieces inexpensive so you’re free to experiment and make mistakes without suffering a huge loss. You knew it was coming. At this point, you’ve developed some basic skills to help you put together outfits that work, and understand how clothes should fit. You’ve also put together a basic wardrobe of everyday, inexpensive items that look good together. You’ve developed a basic dress sense, and you know roughly what to look for when adding new items to your wardrobe. This is a big accomplishment! But now it’s time to take things to the next level. High end menswear elevates fashion from a practical hobby to an expression of yourself. 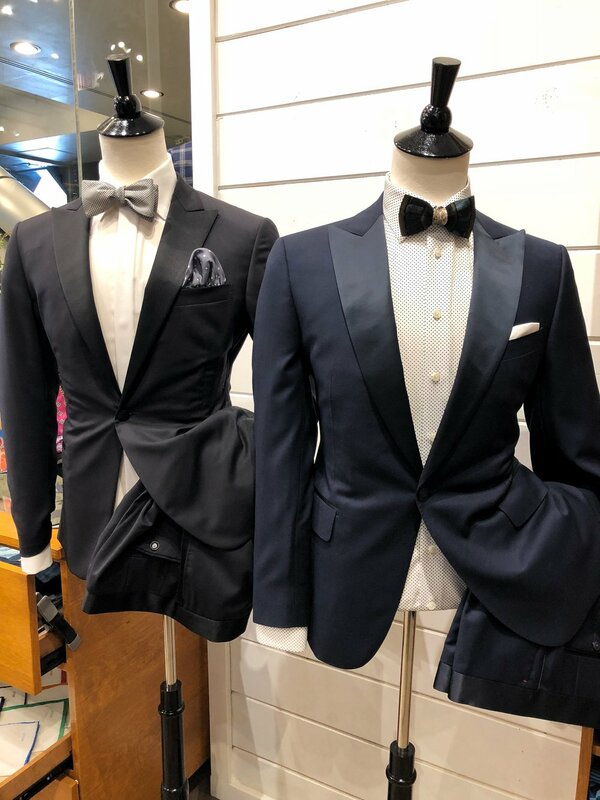 Now that you’ve done your homework, you get to enjoy the fun part -- if you’ve developed a love for formalwear, the feeling of wearing a hand-tailored Canali suit for the first time will be uncomparable. Finally, armed with your new knowledge, you get to finesse the details and put together outfits that feel perfectly crafted for your exact tastes because they literally are. You could go to many menswear boutiques, but I find that Blaine’s offers not just a broad selection of exceptionally high-quality American and European garments that can fit any aesthetic, but also excellent customer service that’ll help you find precisely the item you’re looking for. And there you have it! If you follow these steps, you’ll be able to develop a personal style that you’re proud to call your own even if you’re an absolute fashion beginner. And at the end of the day, I hope no matter what you decide to put on, it’s something that makes you look and feel awesome. Because at the end of the day, beyond all the intractable rules of fashion, the only important thing is that the clothes you wear are ones you’re proud of. If you’re ready to take your menswear game to the next level, feel free to drop by Blaine’s website or visit their Montgomery location for some of the best men’s fashion that Cincinnati has to offer.